Sometime in the 80's, a couple had just arrived at Seattle airport from New York. The woman was heard to say, "Look, dear! 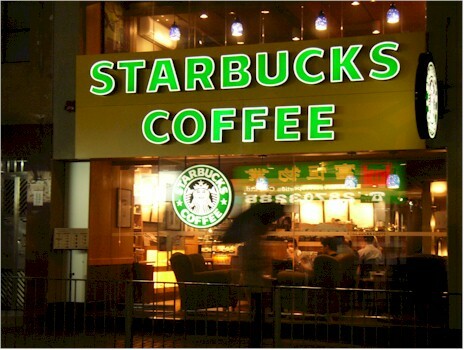 They even have Starbucks out here." The signature coffee house of the 60's that I recall is Chock Full o'Nuts. They had those funny crooked chimneys on somewhat whimsical looking houses. The urban CFoN made use of whatever space could be had. These were usually deep, narrow spaces in which the company would install a long, serpentine counter. For turnpike travellers, I think Howard Johnson had the franchise at most of the service plazas between Washington and New York back then.